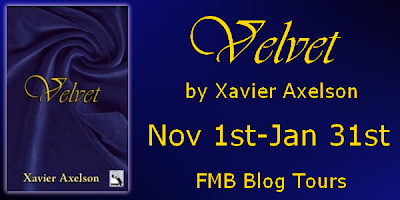 herding cats & burning soup: Spotlight: Velvet by Xavier Axelson + giveaway!! 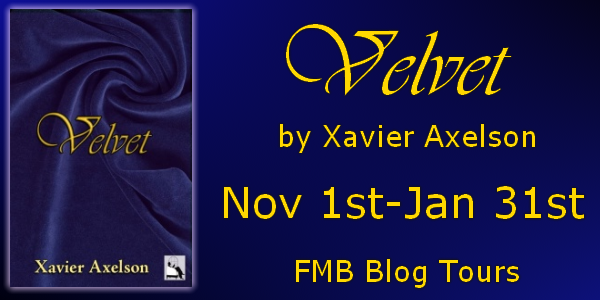 The first novel from Xavier Axelson is set against a backdrop of decadence, privilege and intrigue. Virago, the royal tailor, makes a discovery that will test the bonds of brotherhood, unravel the forbidden secrets of his heart and threaten the very fabric of his existence. I’d been staring at the vast body of water surrounding the ship when I was startled to find a woman, heavy with child standing by my side. She wore a red gown that gathered beneath her ample breasts. The gown fell freely, billowing against her in the brisk sea air. Her red hair hung in two braids threaded with crimson leather. Upon turning her head, small red jewels, woven throughout her hair, caught the light. “Who are you?” I asked. Since I’d boarded the ship the day before, I’d conversed only with Seton and my brother, Sylvain. I’d yet to earn my sea legs and everything seemed strange. “You talk as though you know me, and as I am a stranger on this ship, I know this cannot be.” I was about to bow and take my leave when she laughed. Were the royal tailor… Her words struck at my heart. I felt this truth so keenly that I gripped the ship railings to steady myself. After this outburst, we grew silent, but the woman did not leave my side. I closed my eyes and swallowing hard, felt the pull of the stiff fabric scrap tied around my throat. The raucous shrieks of hungry gulls overhead made me look up into the sky. I watched as the birds swooped and mercilessly chased each other. I envied their flight, but cringed beneath their cries. Behind my eyes, I saw white peacocks, heard their shrieks, and felt the crawl of disease. I shuddered, shook my head of further memory, and let my eyes fall upon the distant horizon. Would I never know peace? Or would memories chase me like the gulls chase one another, endlessly hungry and insistent? When Adis eventually spoke, these questions and memories faded away. The truth in her words, stirred long buried pain. While Sylvain’s blind, tumultuous, and bloody welcoming into the world killed our mother, it also strengthened my father’s resolve to care for us at any cost. I know not what would have become of us without King Killian’s demand for my meager abilities as a tailor. We would have been lost, we owe our king a great debt and service. My father told this to me one day when I found him bleary eyed and exhausted at his work. I could remember the way his hands trembled, the nerves in his fingers twitching involuntarily as he struggled with buttonholes on a vest meant for Killian’s nephew. When his voice vanished, a bitter sadness rose in me as the sea’s waves crashed against the ship. Before she could reply, music, soft and familiar reached us. I knew the player of the tune, knew it because my heart leapt at its playing as it did the first time I’d heard it. “Someone has leant Seton a lyre. How beautifully he plays, and how lucky his hands are healing. He is a man of passion and strength. It is no wonder you found love with him, as he with you.” Adis placed a hand on my wrist. “I am no witch or visionary. My daughter beckons from my womb. I am but a vessel as is this ship. “I have not heard talk of the tree witches since I played at my mother’s feet. Surely they no longer exist!” I replied, incredulously. “I cannot say. Who can say if they exist or ever really did?” Adis said. With these words, Adis left me. I stood alone, listening to the sea, the sound of Seton’s music, the distant cries of the squabbling gulls, and my eyes focused on the unknown horizon. What led me to find myself on the water, destination unknown? The life I knew was gone, broken, and mercurial as the swirling foam frothing in the ships crushing wake. I would tell myself the story, if only to steal a glimpse at the unknown ending. Once upon a time there was a tailor. 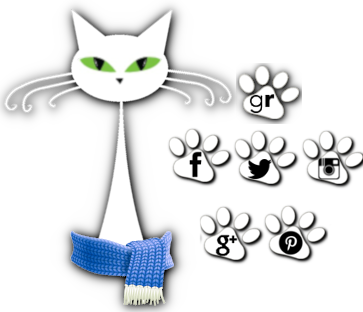 He knew string, scissor, and pin. He did not know his heart. No, it cannot begin this way. My heart knew dangerous things, but now it was free and in it’s new freedom I allowed it to teach me the way my story should begin and knew by wild instinct, if I followed it, I would know the ending, a true, and dare I hope, happy ending. With no one to listen but the dark sea and the wheeling, crying gulls, I closed my eyes and let my thoughts move with the undulating water, its gentle rocking seeming to urge the release of my torment. Xavier Axelson is a writer and columnist living in Los Angeles. I thought so too Maureen! Good luck! WOW!!! I loved the excerpt and can't wait to read more!! Thanks for the chance to win a copy!! Hope you enjoy it Elizabeth! Happy reading! would love to win & read!! Great excerpt, this is going to be a good read! Thanks for having me and hosting Velvet!